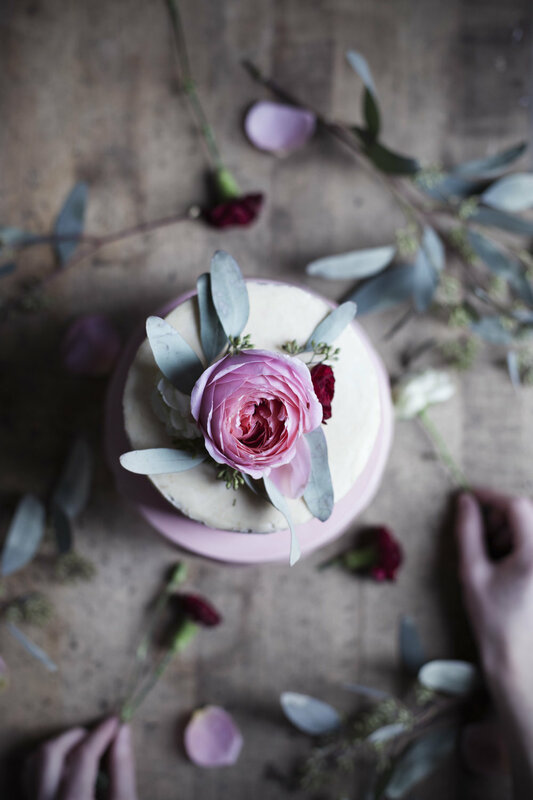 this week calls for the prettiest of cakes because we are celebrating the two year blogiversary of hey modest marce! TWO YEARS!!!! so much has changed since i started this little baking blog of mine. i've worked with brands i could have only dreamed of working with two years ago, we left the city behind & we bought a house in a much smaller town. thank you so much to everyone who takes the time to read my blog & bake from my recipes. i love seeing your images & reading your comments! it means a lot more then you think. p.s. 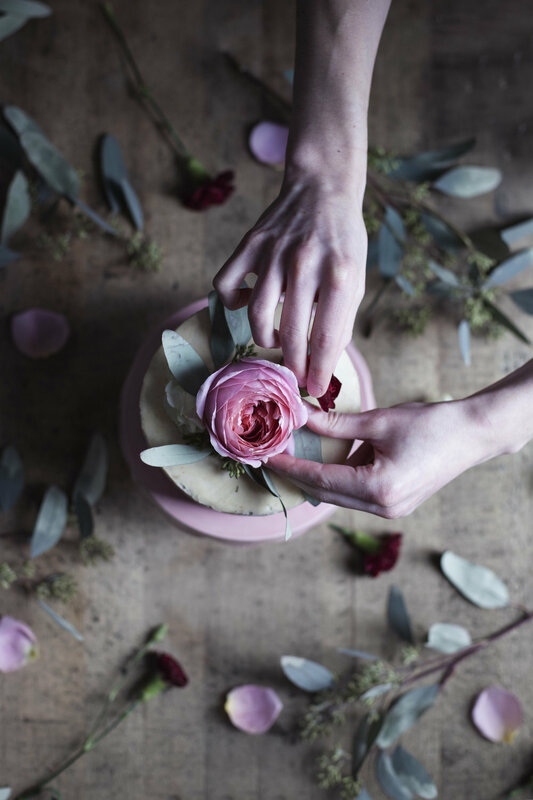 this pretty in pink cake stand is made by the lovely anna wallace. it is the perfect shade of rose pink! in the bowl of a stand mixer fitted with the paddle attachment beat the butter & sugar until light + fluffy. add in the eggs one at a time followed by the vanilla extract & oil. in a separate bowl sift the flour, cinnamon, baking powder & salt. alternate between adding this & the cream to the stand mixer. evenly divide intro three 6-inch (greased & lined) round cake stands. bake for 18-20 minutes or until the top bounces back to touch. let cool while you prepare the frosting. in the bowl of a stand mixer fitted with the paddle attachment beat the butter, sugar, cinnamon & vanilla until fluffy, about 8-10 minutes. add in the whipping cream & beat for an additional 30 seconds. top with fresh flowers, herbs & greens. NOTE: if you plan to frost the entire cake double the frosting recipe. this recipe is just enough to decorate a naked cake!